This beautiful demitasse cup & saucer set was part of the collection used for Cunard's on-board tea service for Ocean Liners RMS Queen Elizabeth and Queen Mary. The iconic rectangular shape of this set is highly coveted by collectors for its unique design, which besides the artistic value was also incredibly practical for storing aboard ships. The base color is a light cream/ivory, with painted striping in a muted gray, mustard yellow, and black. 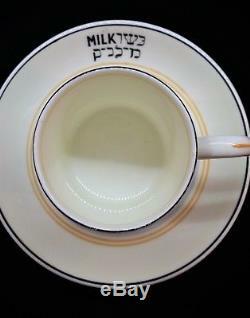 This set is more rare than usual as it is from the ships' "Kosher" collection, which included terms in both English and Hebrew; this saucer of this set reads "MILK" in both languages. We do have a set of demitasse cups & sauces which reads "MEAT" in both English and Hebrew as well in a separate listing. The set is in flawless condition, completely free of chips or cracks. Listing is for just ONE cup & saucer set, though if you are interested there is a matching set (as well as quite a few other pieces from this Tea Collection), please see our other listings for availability. Measurements: Saucer diameter: 4 1/2. Cup diameter: 2" Cup height: 2 1/4". 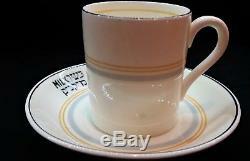 The item "Vintage Cunard Foley Bone-China HebrewithKosher Demitasse Cup & Saucer Set MILK" is in sale since Tuesday, February 13, 2018. This item is in the category "Pottery & Glass\Pottery & China\China & Dinnerware\Other Tea Pots & Tea Sets". The seller is "lynnsb105" and is located in Santa Barbara, California. This item can be shipped to United States.